Win VIP treatment at Back to 95 at Proud 2. You are here: Home / competitions / Win VIP treatment at Back to 95 at Proud 2. SVA, the pioneers of Old Skool House and Garage events bring you the second installment of 2012 following their magnificent 11th birthday celebration. Over the past 11 years they have consistently hosted parties at some of London’s most prestigious nightclubs such as Legends, Emporium, Heaven and Ministry of Sound. 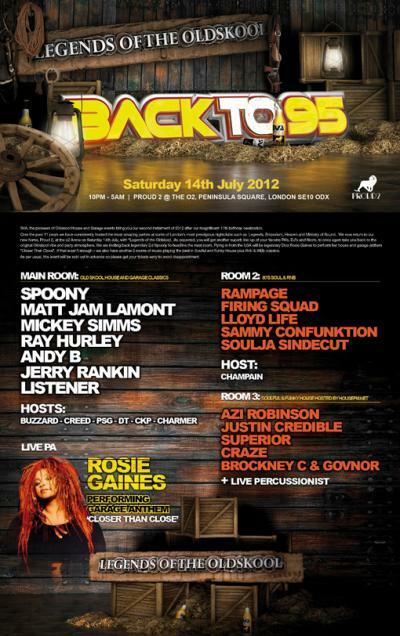 They now return to thier home, Proud 2, at the o2 Arena on Saturday 14th July, with “Legends of the Oldskool”. As expected, you will get another superb line-up of your favorite PAs, DJs and Hosts, to once again take you back to the original Old Skool vibe and party atmosphere. They are inviting back former Radio 1 star DJ Spoony to headline the main room and flying in from the USA will be legendary Diva Rosie Gaines to perform her anthem “Closer Than Close”. If that wasn’t enough – there is also another 2 rooms of music playing the best in Soulful and Funky House plus Rnb & 80′s classics. Plain and Simple are giving away 6 tickets and a VIP table for this event, so you can have it old skool in style! To enter tell us – who is hosting the outside terrace at this event? Send your answers to jo@plainandsimple.tv by the 10th July to enter, don’t forget to include your contact info! Catch Justin Martin side by side with Redlight- and Win tickets!